Michael & Karen are probably one of the most sweetest and down to earth couples you would ever meet. Luke & I loved our time with them this past Friday and we already know that their July wedding is going to be one to remember! These two met at Valley Forge Christian College. They both attend there and Michael is a worship leader at his church. Karen also sings so I think it is pretty awesome that both have a passion for music and worship. As we were deciding on locations for the shoot Luke mentioned Olde Town Portsmouth. We don’t go there often but when we do we always love it! The gorgeous homes and streets make me want to pack my bags and move there today! am loving Spring and all this warm weather after what seemed like a very very long winter! I love the way these two are with one another. They both are so relaxed, love to have fun, and just the sweetest couple ever! I love Karen’s confidence and smile. I love the way Michael looks at her and the faces he makes when she’s not looking. I can go on and on about these two. They seriously were both amazing and we are so excited for their wedding! They had some friends that came to take pictures with them! Had to stop for some puppy love! Seriously Karen… Could you be any more beautiful??? 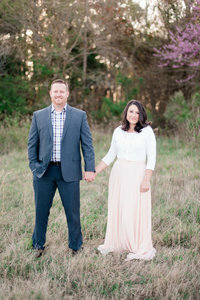 Such a cute engagement session! I love the photos with their pup! they look like they had so much fun!! Thank-You Caitlin! They are such a laid-back couple and we really did have a great time with them! Beautiful composition. Lovely backdrops. Fabulous combinations of spring color. Gorgeous ring shots. Precious expressions. In short, absolutely stunning pictures! Thank you, Luke and Ashley, for capturing our kids with such artistry!